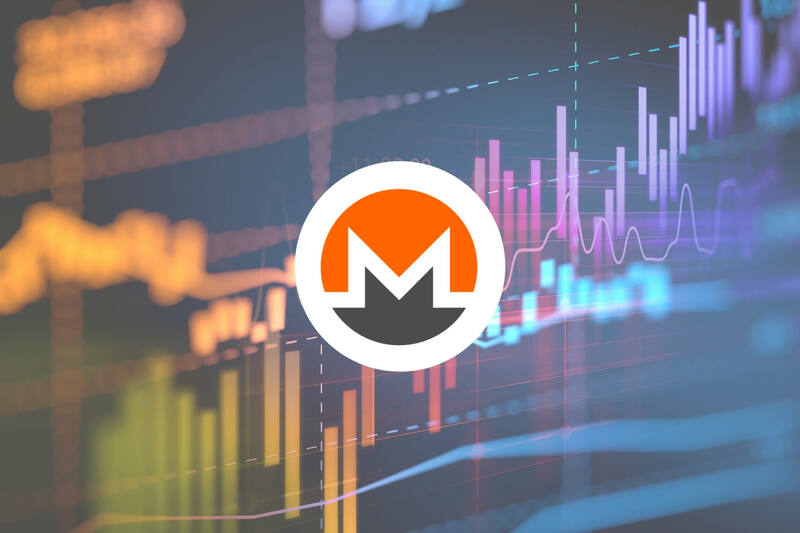 Monero Price Analysis: XMR Breaks Back Above $50 -- Will the Bullish Momentum Continue? Support for XMR moving forward: $49.59, $46.92, $45.56, $43.85, $43.12, $41.82. Resistance for XMR moving forward: $52.25, $55.56, $58.22, $60.00, $67.24, $69.21, $70.46. Monero has seen a 2.42% price hike over the past 24 hours of trading, bringing price action back above the $50.00 handle to $50.05. The market has now seen a a 15% price rise over the past trading week. However, Monero still is down by a total of 45% over the past 90 trading days. XMR is ranked in 13th position as it currently holds a $825 million market cap valuation. The 57-month old project now trades at a value that is 90% lower than the all-time high price. 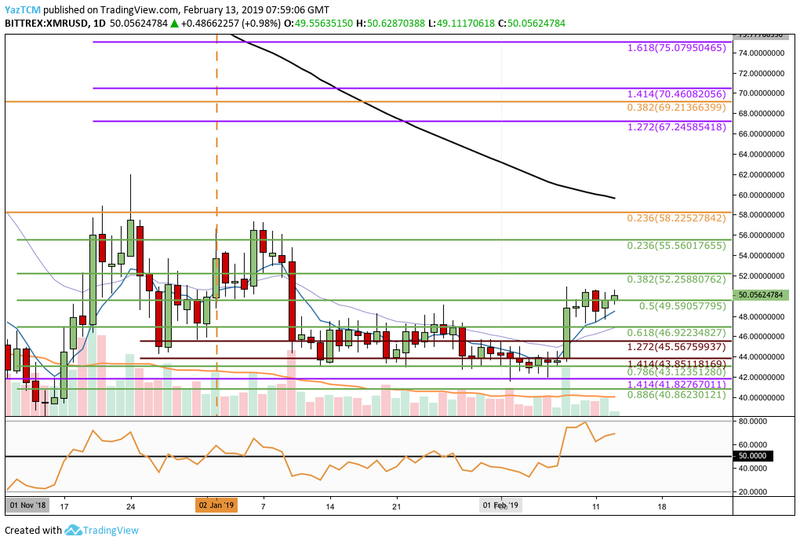 Since our last XMR/USD analysis, we can see that price action continued to trade within the previously identified range between $46.92 and $43.12 for the remainder of January 2019. Price action experienced some spikes lower but these were supported by the previous long-term downside 1.414 Fibonacci Extension level (drawn in purple) priced at $41.82. We can see that the market had experienced a significant surge on February 8, 2019 when price action began at a low of $43.85 and rose to a high above the $50.00 handle, breaking above the upper boundary of the previous trading range. Since this surge, the market has managed to maintain itself above the previous range as it now trades at support above the short-term .5 Fibonacci Retracement level (drawn in green) priced at $49.59. The break above the $46.92 handle has now shifted this market into a bullish trading condition after creating a fresh high for the month of February 2019. For this market to be considered bearish, we would need to see the market fall below the $43.12 handle to create a lower low in price. Where is the XMR/USD Market Likely to Head Towards Next? If the buyers can continue to cause XMR/USD to climb further higher, they will meet immediate resistance above at the short-term .382 and .236 Fibonacci Retracement levels (drawn in green), priced at $52.25 and $55.56 respectively. Further strong resistance above this can be expected at the bearish .236 Fibonacci Retracement level (drawn in orange) priced at $58.22. This bearish Fibonacci Retracement is measured from the high seen in November 2018 to the low witnessed during December 2018. If the bullish momentum drives XMR/USD even higher, there is more resistance located at the medium-term 1.272 Fibonacci Extension level (drawn in purple) priced at $67.24. Following this is more resistance at the bearish .382 Fibonacci Retracement level (drawn in orange) priced at $69.21. If XMR/USD breaks above the $70.00 handle, we can then expect more resistance at the medium-term 1.414 and 1.618 Fibonacci Extension levels (drawn in purple) priced at $70.46 and $75.07, respectively. What if the Sellers Regroup and Push Price Action Lower? Alternatively, if the sellers begin to push XMR/USD below the support at $49.59, we can expect immediate support beneath at the short-term .618 Fibonacci Retracement level (drawn in green) priced at $46.92. This is followed closely by more support at the downside 1.272 and 1.414 Fibonacci Extension levels (drawn in red), priced at $45.56 and $43.85 respectively. If the bearish momentum drives XMR/USD even lower, there is more support located at the short-term .786 and .886 Fibonacci Retracement levels (drawn in green) priced at $43.12 and $40.86, respectively. We can see that the XMR/BTC market had managed to maintain itself above the .786 Fibonacci Retracement level (drawn in green) priced at 0.01226 BTC for the remainder of January 2019 after our previous analysis. 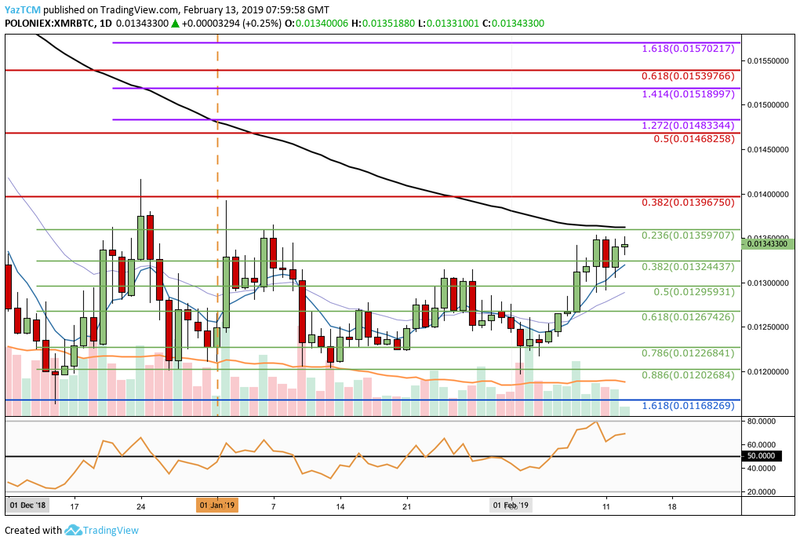 As February 2019 commenced, the XMR/BTC market began to surge as it rallied from a low of 0.01226 BTC to a high around 0.01350 BTC. The market has still not managed to break above this level of resistance as it continues to try and climb above 0.01350 BTC. The market is currently bullish in the short term as price action has managed to create a higher high above the 0.013 BTC handle. However, for this market to be considered bullish in the long term, we will need to see price action break above the 0.01359 BTC level. Where is the XMR/BTC Market Likely to Head Towards Next? If the buyers continue to drive XMR/BTC above the resistance at the 0.01350 BTC handle and above the resistance at the short-term .236 Fibonacci Retracement level at 0.01359 BTC, we can expect immediate higher resistance located at the bearish .382 Fibonacci Retracement level (drawn in red) priced at 0.01396 BTC. Further resistance above this level is then located at the bearish .5 Fibonacci Retracement level (drawn in red) priced at 0.01468 BTC, closely followed by higher resistance at the medium-term 1.272 and 1.414 Fibonacci Extension levels (drawn in purple), priced at 0.01483 BTC and 0.01518 BTC respectively. What if the Bears Regain Control of the Momentum? Alternatively, if XMR/BTC fails to break above 0.0135 BTC and price action goes lower, we can expect immediate support located at the short-term .382 and .5 Fibonacci Retracement levels (drawn in green), priced at 0.01324 BTC and 0.01295 BTC respectively. Further support beneath this level can be expected at the short-term .618 and .786 Fibonacci Retracement levels (drawn in green), priced at 0.01267 BTC and 0.01226 BTC respectively. The Monero market has been on a tear recently against both the USD and BTC. Monero will now need to break above the 0.0135 BTC handle for the market to continue to travel higher.